The following setup process for your website will take 10-15 minutes to complete. Your ID is exactly 9 characters. This will be your username when you log into your site. These are the names of the towns, counties, and area names that you serve. This information will appear exactly as you type it, so please proofread carefully. You can edit this later. Use the Zip Code where you do the most business (not necessarily where you office is based). This will be the email address that people will see on your site. ONLY use this if you want to receive text messages from customers. If you have more than two locations, you can add the additional locations and hours in the dashboard after website creation (under Site Configuration). This is how your address or addresses will appear on your site. TIP: This is the name that people will see on your website. The is the domain at which your site will appear. For example business-name.viasatretailer.com Warning: once you setup your website, this website address cannot be changed. Already have a domain name that you want to use for your website? If so, check the box below. This will override and replace the website subdomain address above. Please note: you can add this later if you're not ready now. This will require additional steps after you set up your website. If you already have a domain name or plan to get a custom domain name, enter it here. The home page will be added to the site regardless of whether you select it here. Select it now if you wish to customize it now (you can also do this later). Select the other pages you wish to have included in your website now. You can customize, add, and/or delete some of these pages later if you prefer. You also can change some of the images on these pages later. This is content that will show up on your homepage. You can change the content below or after you create your website. This MANAGED RETAILER WEBSITE END USER TERMS AND CONDITIONS AGREEMENT (“ Agreement”) is an agreement between you and Viasat, Inc., with its principal place of business at 6155 El Camino Real, Carlsbad, California, 92009 (“ Viasat”). This Agreement governs your use of Viasat’s Managed Retailer Website application that provides you with managed website services for use with soliciting orders for Viasat Internet service in accordance with your Dealer Agreement between you and Viasat (“ Dealer Agreement”), and any and all related documentation, updates, and upgrades that replace or supplement Viasat’s Managed Retailer Website application in any respect which are not distributed with a separate license agreement (the “ Application”) and your use of the Application and related services (collectively the “ Service”). The Application, and your use of the Service, is licensed to you, not sold. BY USING THE APPLICATION OR SERVICE, YOU AGREE TO THE TERMS OF THIS AGREEMENT AND AGREE TO BE BOUND BY THEM AND CONSENT TO OUR DATA PRACTICES AS SET FORTH IN THE SERVICE’S PRIVACY NOTICE available here. If you do not agree to the terms of this Agreement, including the Service’s Privacy Notice, then you may not use the Application. This Agreement is enforceable against any person or entity that uses the Service or any person or entity that uses the Service on another person’s or entity’s behalf. The terms of this Agreement may be changed upon posting a new Agreement at https://www.exede.com/documents/master/managed-retailer-website-eula.pdf, which will apply upon such posting to any continued use of the Service; provided, however that material changes only apply prospectively to your continued use and the terms in effect during prior use will continue to govern such prior use. Grant. Through subscribing to the Service and using the Service, you are acquiring and Viasat grants you a limited, non-exclusive, worldwide, non-transferable, nonsublicensable, revocable license to use the Application, and to use the Service, for your use on a single, authorized device solely as set forth in this Agreement (the “License”). Your acquired rights are subject to your compliance with this License. You are expressly prohibited from sub-licensing, renting, leasing, transferring or otherwise distributing the Application or rights to use the Application and Service. The term of your License shall commence on the date that you first use or access the Service or Application, and shall end on the earlier of the date that you permanently discontinue use of the Application, or Viasat terminates this Agreement. Restrictions. Your right to use the Application and the Service is limited to the License grant herein, and you may not otherwise copy, display, seek to disable, distribute, perform, publish, modify, transfer, create works from, or use the Application or any component of the Service, except as expressly authorized in writing by Viasat or as set forth in Section 1(d) below. Unless expressly authorized in writing by Viasat, you are prohibited from making a copy of the Application available publically where it can be used or downloaded by any other users. You may not remove or alter Viasat’s trademarks, logos or legal notices in the Application or in Viasat’s related assets. Your right to use the Service is also predicated on your compliance with any applicable terms of agreements you have with third parties when using the Service. For instance, if use of the Service is in violation of your service agreement with your current internet service provider, then you may not use this Service. Additionally, you may not distribute, provide or otherwise make the Application, or any component of the Service, available to any third party, in whole or in part, through any medium or process. Nothing in this License entitles you to use the Application, or any component of the Service, to create software products or development tools, or receive the source code to the Application, or any component of the Service, in whole or in part, unless otherwise expressly agreed in writing by Viasat or as set forth in Section 1(d) below. Reservation of Rights. Except as expressly licensed to you herein, Viasat reserves all right, title and interest in the Application and other aspects of the Service (including, but not limited to, all images, photographs, animations, video, text, and content), and all associated copyrights (including, but not limited, copyrights, copyright registration and copy rights with respect to computer software, software design, software code, software architecture, firmware, programming tools, graphic user interfaces, reports, dashboards, business rules, use cases, screens, alerts, notifications, drawings, specifications and databases), moral rights, trade secrets and other rights with respect to confidential or proprietary information, know-how, other rights with respect to inventions, discoveries, ideas, improvements, techniques, formulae, algorithms, processes, schematics, testing procedures, technical information and other technology, trademarks, and other intellectual and industrial property rights therein. Notwithstanding the foregoing, Viasat does not assert any intellectual property rights or copyrights over the content posted by you through your use of the Application. Except as expressly stated in this License, Viasat does not grant you any intellectual property rights in the Application, or any other component of the Service, and all right, title, and interest in and to all copies of the License not expressly granted herein remain with Viasat, its suppliers and/or its licensors. Except to the extent permitted under this License or applicable law, you may not decompile, disassemble, or reverse engineer the Application, or any component of the Service, by any means whatsoever. The Application is copyrighted and protected by the laws of the United States and other countries, and international treaty provisions. You may not remove, alter, or obscure any product identification, copyright, or other intellectual property notices in the Application. All rights not expressly granted herein are reserved by Viasat, its suppliers and/or its licensors. Open Source Software Notice. This Application contains open source software released under various open source licenses. The terms of each open source license used by this Application are available at https://www.exede.com/documents/master/managed-retailer-website-open-source-license.pdf (collectively, the “OSS Licenses”), and such OSS Licenses are hereby incorporated into this License. The OSS Licenses only apply to the specific open source software specified in such OSS License and shall not affect the interpretation, validity or enforceability of this License. Consent to Use Data. A condition of this License is your consent to our Service data practices set forth in the Service’s Privacy Notice, which describes how the Service collects and how we process, use, share and secure Service data. For instance, when using this Application, the Application sends data to Viasat. The specific Application information provided to Viasat, or its third-party service providers, includes any information you provide directly to Viasat through the Application, all content you post on the Application, your legal business name, physical business address, your Viasat issued retailer identification number, and your e-mail address. Compliance. You may only use the Application or Service if you have a valid Dealer Agreement with Viasat and you are in compliance with all terms and conditions of your Dealer Agreement, including, but not limited to, compliance with Viasat’s marketing policies, rules and guidelines published on the dealer portal (the “ Marketing Guidelines”). Your right to use the Service is also predicated on your compliance with all laws, rules and regulations. You represent and warrant that for any content you post on the Application or Service that you have a lawful right to reproduce and post such content on the Application and use it as the Service. You further represent and warrant that any content you post is lawful content. You are solely responsible for the content you post. TO THE FULLEST EXTENT PERMISSIBLE UNDER APPLICABLE LAW, YOU AGREE TO INDEMNIFY VIASAT AND ITS SUBSIDIARIES, AFFILIATES, LICENSORS AND SUPPLIERS FROM ANY AND ALL CLAIMS, INCLUDING INTELLECTUAL PROPERTY AND COPYRIGHT CLAIMS, ARISING OUT OF, OR RELATED TO, ANY CONTENT YOU POST. Viasat reserves the right to remove any content from the Application and Service, immediately, in its absolute discretion, without notice to you, for any reason or no reason. Access. You must provide at your own expense the equipment, internet connections or devices and/or service plans to access and use the Service. Viasat does not guarantee that the Application or other aspects of the Service can be accessed or used on all devices or all operating systems. Viasat does not guarantee that this Service will be available in all geographic locations. You acknowledge that when you use the Service, your internet service provider or wireless carrier may charge you fees for data, messaging and/or other internet access. Check with your internet service provider or wireless carrier to determine if there are any such fees that apply to you. YOU ARE SOLELY RESPONSIBLE FOR ANY COSTS YOU INCUR TO ACCESS OR USE THE APPLICATION OR SERVICE FROM YOUR DEVICE. Consent to Receive Push Notifications. You consent to Viasat sending you push notifications or other types of messages sent directly to you through this Application (collectively, “ Push Notifications”). Push Notifications are a way for the Application to provide you information and alerts associated with your use of the Application. You may discontinue Push Notifications by discontinuing use of the Application. Contact Information. By providing Viasat with your e-mail address, you consent to Viasat or its agents sending e-mails (including, but not limited to, automated emails via the Application) to such email address for: (a) any Application-related issues and (b) leads submitted by potential Viasat Internet customers through the Application. If you do not wish to receive emails, you must discontinue your use of the Application by contacting getapproval@viasat.com and requesting to terminate your Application account. Approval and Review of Your Content. All content (including, but not limited to, all text, images, graphics, photographs, animations, and videos) you contribute to the Application (“ Your Content”) is subject to Viasat’s approval. 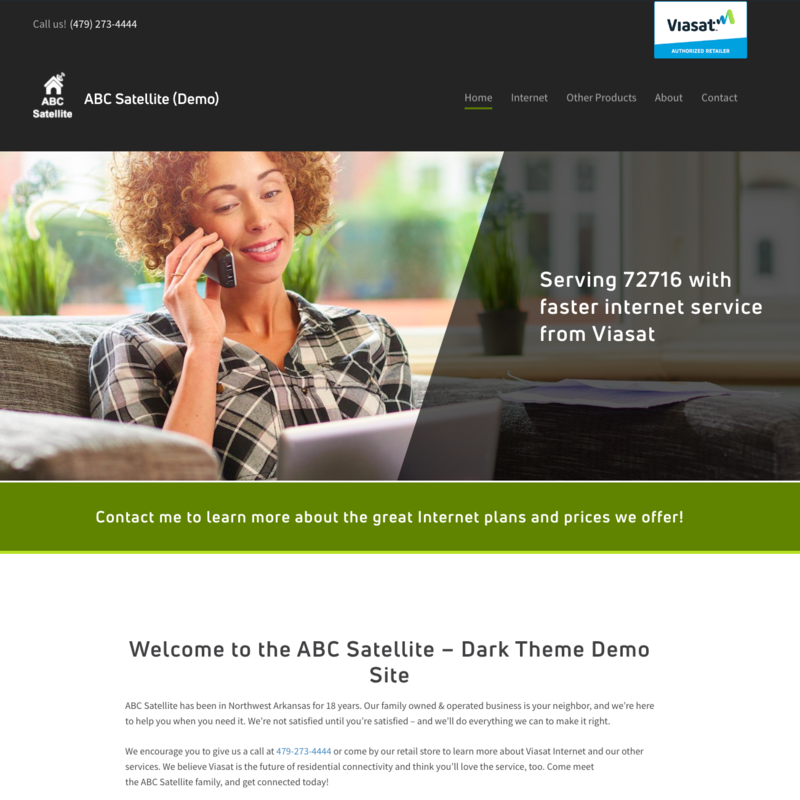 During your initial setup of your website using the Application, you must obtain approval from Viasat of Your Content prior to Viasat posting your website to the public. Thereafter, you must contact Viasat for approval of any changes to Your Content that are associated in any way with any Viasat services or products, or any Viasat trademarks or service marks. To obtain approval of Your Content, email getapproval@viasat.com. From time-to-time, Viasat will review Your Content for compliance with this Agreement and your Dealer Agreement, including, but not limited to, the Marketing Guidelines. If Viasat requests any revisions to Your Content, you must make such revisions within two business days of receiving such request. Viasat may suspend your use of the Application immediately, at any time, with or without notice, if you are in violation of this Agreement or your Dealer Agreement, including, but not limited to, the Marketing Guidelines. Fees. The fee to use the Service and Application is $60.00, excluding taxes and surcharges, each calendar quarter (“ Application Fee”). Payment Terms. All funds to be collected or withheld from you may be handled either by Viasat directly or by Viasat’s designated agent, or other third party payment processor, to be determined in Viasat’s sole discretion. Viasat, or its designated agent, shall invoice you for amounts payable hereunder on a quarterly basis. You shall pay to Viasat all amounts set forth in each invoice within thirty days following the date thereof. The Application Fee may be eligible for partial or full reimbursement by Viasat issued co-operative marketing funds at Viasat’s sole discretion. Notwithstanding anything to the contrary set forth herein, Viasat reserves the right, in Viasat’s sole discretion and from time to time, to require pre-payment of any or all amounts payable to Viasat by you under, or in connection with, this Agreement. Your failure to timely remit payments to Viasat shall constitute a material breach of this Agreement. Offsets. Viasat shall have the right, but not the obligation, to offset the Application Fee from any other amounts Viasat owes you. Your Contributions. In exchange for use of the Service, and to the extent that your contributions through modifying, altering, adding onto or generally using the Application, or any other component of the Service, give rise to any intellectual property right interest, including copyright interest, you hereby grant Viasat an exclusive, perpetual, irrevocable, fully transferable and sub-licensable worldwide right and license to use your contributions in any way and for any purpose, including the rights to reproduce, copy, adapt, modify, perform, display, publish, broadcast, transmit, or otherwise communicate your contributions to the public by any means, whether now known or unknown, and distribute your contributions without any further notice or compensation to you of any kind for the whole duration of protection granted to intellectual property rights by applicable laws and international conventions. Termination. The Agreement is effective until terminated. You may terminate this Agreement at any time by emailing getapproval@viasat.com and requesting to terminate your Application account. Viasat may terminate this Agreement (and your License rights) at any time, in its sole and absolute discretion, with or without notice. Your rights under this Agreement will terminate immediately and automatically without any notice from Viasat if you fail to comply with any of the terms and conditions of this Agreement or your Dealer Agreement (including, but not limited to, the Marketing Guidelines). Promptly upon termination, you must cease all use of the Application and the Service and destroy all copies of the Application in your possession or control. Termination will not limit any of Viasat’s other rights or remedies at law or in equity. Sections 1(a), 1(b), 1(c), 2(a), 2(b), 2(e), 3, 4, 5, 6, 7, 8, 9, 10, 11, 12, 13, and 14 of this Agreement shall survive termination or expiration of this Agreement for any reason. (C) VIASAT DOES NOT WARRANT THAT THE SERVICE WILL MEET YOUR REQUIREMENTS, THAT OPERATION OF THE SERVICE WILL BE UNINTERRUPTED OR ERROR-FREE, THAT THE SERVICE WILL INTEROPERATE OR BE COMPATIBLE WITH ANY OTHER APPLICATION OR SERVICE, THAT ANY ERRORS IN THE SERVICE WILL BE CORRECTED, THAT THE INFORMATION CONTAINED IN THE SERVICE IS TRUE AND ACCURATE, OR THAT THE APPLICATION WILL BE AVAILABLE FOR REINSTALLS TO THE SAME OR MULTIPLE DEVICES. NO ORAL OR WRITTEN ADVICE PROVIDED BY VIASAT OR ANY AUTHORIZED REPRESENTATIVE SHALL CREATE A WARRANTY. Limitation of Liability. TO THE FULLEST EXTENT PERMISSIBLE BY APPLICABLE LAW, IN NO EVENT SHALL VIASAT BE LIABLE TO YOU FOR ANY DIRECT, INDIRECT, SPECIAL, INCIDENTAL, CONSEQUENTIAL OR PUNITIVE DAMAGES (INCLUDING LOSS OF USE, DATA, OR PROFITS OR BUSINESS INTERRUPTION) ARISING OUT OF OR RELATED TO THIS AGREEMENT OR THE USE OR PERFORMANCE OF THE SERVICE OR APPLICATION, WHETHER SUCH LIABILITY ARISES FROM CONTRACT, WARRANTY, TORT (INCLUDING NEGLIGENCE), STRICT LIABILITY OR OTHERWISE, AND WHETHER OR NOT VIASAT HAS BEEN ADVISED OF THE POSSIBILITY OF SUCH LOSS OR DAMAGE. THE PARTIES HAVE AGREED THAT THESE LIMITATIONS WILL SURVIVE AND APPLY EVEN IF ANY REMEDY IS FOUND TO HAVE FAILED OF ITS ESSENTIAL PURPOSE. WITHOUT LIMITING THE FOREGOING, AS PERMITTED BY APPLICABLE LAW, VIASAT SHALL HAVE NO LIABILITY OR RESPONSIBILITY FOR ANY BUSINESS INTERRUPTION OR LOSS OF DATA ARISING FROM THE TERMINATION OF THIS AGREEMENT OR THE LICENSE RIGHTS GRANTED HEREIN AND ANY ASSOCIATED CESSATION OF THE FUNCTIONS OF THE SERVICE. VIASAT IS ACTING ON BEHALF OF ITS SUBSIDIARIES, AFFILIATES, LICENSORS AND SUPPLIERS FOR THE PURPOSE OF DISCLAIMING, EXCLUDING AND LIMITING OBLIGATIONS, WARRANTIES AND LIABILITY, BUT IN NO OTHER RESPECTS AND FOR NO OTHER PURPOSES. AS PERMITTED BY APPLICABLE LAW, IN NO EVENT SHALL VIASAT’S TOTAL LIABILITY TO YOU FOR ALL DAMAGES (EXCEPT AS REQUIRED BY APPLICABLE LAW) EXCEED $60.00. Limitation of Liability and Disclaimer of Warranties are Material Terms of this Agreement. You agree that the provisions of this Agreement that limit liability and disclaim warranties, as permitted by applicable law, are essential terms of this Agreement. Severability and Survival. If any provision of this Agreement is illegal or unenforceable under applicable law, the remainder of such provision shall be amended to achieve as closely as possible the effect of the original term and all other provisions of this Agreement shall continue in full force and effect. Export. You will comply fully with all relevant export laws and regulations of the United States and any other country (“ Export Laws”) where you use the Service. You certify that you are not on any of the U.S. Government lists of prohibited persons, including but not limited to the Treasury Department’s List of Specially Designated Nationals, and the Commerce Department’s List of Denied Persons or Entity List. You further certify that you shall not export, re-export, ship, transfer or otherwise use the Application, or any other component of the Service, in any country subject to an embargo or other sanction by the United States, including but not limited to, Iran, Syria, Cuba, Sudan and North Korea, and that you shall not use the Service for any purpose prohibited by the Export Laws, including, but not limited to, nuclear, chemical, missile or biological weapons related end uses. Injunctive Relief. You agree that your breach of this Agreement will cause irreparable injury to Viasat for which monetary damages would not be an adequate remedy and Viasat shall be entitled to seek equitable relief in addition to any remedies it may have hereunder or at law without a bond, other security or proof of damages. Applicable Law. This Agreement is made in the State of Colorado. This Agreement and all of the parties’ respective rights and duties, including, without limitation, any claims for breach of this Agreement, shall be governed by and construed in accordance with the laws of the State of Colorado, in the United States, without giving effect to any conflicts of law provisions. Entire Agreement. This Agreement, including the Privacy Notice, constitutes the entire and only agreement with respect to its subject matter between you and Viasat, and is applicable to all users of the Service. This Agreement supersedes all representations, proposals, inducements, assurances, promises, agreements and other communications with respect to its subject matter except as expressly set forth in this Agreement. For the quickest answers on setting up your custom domain, start by browsing the tutorials here for help. If you have additional questions about the managed websites, contact getapproval@viasat.com for assistance.